SEMrush vs Google Keyword Planner – Who Wins? A happy employee is more productive and works with others better. It creates a chain reaction, encouraging other employees to work harder and can transform the entire atmosphere of your business. Raises and bonuses are a great way to achieve this, but how do you motivate employees without money? Today you’re going to learn about 8 types of non monetary rewards that will make your employees encouraged to work harder and enjoy their job. Make sure there’s drinks, and lots of ’em! How tall is the ladder? More than 50% of employees don’t look forward to work parties. Why is that? Probably because they’re boring and not much planning goes into them. Does that sound like work parties you’ve thrown for your employees in the past? You want to create work parties that gets them excited to attend and nervous to miss out on. Here’s how. What food was there at the last party you organized? Donuts, bagels, and coffee? No wonder your workers didn’t want to show up! Make the investment into hiring a good caterer. They will cook delicious food and prepare it in a way that makes it look mouth watering. You can get anything imaginable, too. Italian food? Check. Asian inspired? Done. If you’re going to take this route, do a quick survey among your employees to see what kind of food they like. This is an easy way to boost employee motivation if there’s fun parties to look forward to every holiday or on a set schedule. Who doesn’t like a good drink? And I don’t mean just alcohol. Your work party should have an assortment of drinks, since everyone will be interested in something different. Some may be designated drivers, other may not be interested in alcohol at all. That’s why it’s a good idea to include carbonated water, juice, and coffee. On the flip side, champagne, wine, beer, and other simple alcoholic beverages helps employees loosen up and bond. A study by the University of Pittsburgh found that moderate amounts of alcohol improves social bonding and relieves negative feelings like anxiety. Well, I’m sure they will with food and hanging out with coworkers, but you need to amp up the party! Make your work parties worth going to by hiring a DJ or entertainer. Think about it. You’re going to spend all this money, but how does it come back? When you’re employees are happy to work for your company, they will churn less and be more productive. So, consider hing entertainment and all of the expenses of a good work party as an investment. What’s a party without music? You can hire a professional DJ to put on a real show or even just make a fun playlist to have in the background. Music is proven to make us happier, which will give a boost to any work party. Try going above and beyond by getting a comedian, motivational speaker, or even an illusionist to make it a memorable night. Employees will talk about it for many days after and will want to attend future parties. Did you know that 67% of employees are motivated by praise from managers and 63% are motivated by attention from leaders? Some times it’s the little things that count. Don’t underestimate the power of encouraging your workers. When they complete a project, achieve something great, or impress you, let them know. It’s one of the most effective non monetary incentives in the workplace. Compliment them on a job well done and tell them that the business wouldn’t be the same without them. Think about jobs you’ve worked yourself. Did you receive encouragement very often? If not, how did it make you feel? Probably not very good. But, when you did get encouraged and received positive feedback, I bet you felt amazing. A study in 2017 titled Impact of Motivation on Employee Performances found that employees performed better when praised and expected to be praised in the future. At the same time, an excessive workload was found to be a demotivator, regardless if they were being encouraged or not. What can you learn from this study? Make your employees feel valued while also giving them a realistic workload, or your efforts won’t make much of an impact. Imagine waking up and dreading to go to work. You have coworkers with bad attitudes, a boss that doesn’t pay you any mind, and you have to dress in an uncomfortable suit all day. There are cubicles after cubicles that seem to go on forever. 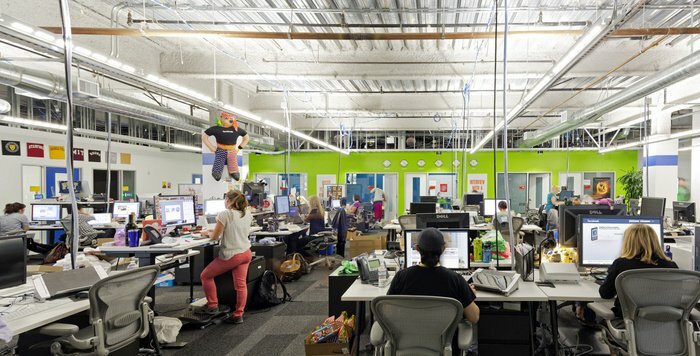 There’s a reason that companies like Facebook destroy this standard work environment and replace it with one that’s very positive. Employees can dress in casual clothing, the office space is open, and it looks more like a university library than anything. Why is this important? Because it makes your employees feel relaxed and positive. Once you see office cultures like Facebook, you can never go back. If you’re a law firm for example, you may not be able to achieve this level of casualness, but it can be done in other ways. Firstly, make sure that teamwork and good behavior is rewarded. Your employees should be able to establish genuine relationships and enjoy being around one another. Just look at Gary Varynerchuk. He talks about how people skills will always trump talent and that’s what he looks for in his own employees. And that’s half of the battle right there. If you hire positive people, it becomes infectious and makes the overall business atmosphere better, boosting team motivation. Secondly, liven up the damn place! No want is interested in staring at empty white walls for 8 hours of the day. Add some paintings, artwork, or sculptures if you can. If you have to get the walls repainted to something better, don’t be afraid to do it. Let your workers bring in their own mementos and items to make their work spaces feel like home, too. Hire a landscaper and make the outside just as welcoming. Plants, flowers, and trees will do just the trick. That’s presuming you have some kind of lawn to work with. For employers with offices in the concrete jungle, invest into professional signs and exterior design. The inside should have nice floors and everything maintained. What’s one time of the day that all workers look forward to? There’s two ways that you can make lunch even better. The first of which is to treat your workers. Save them money and time by taking orders and getting lunch delivered right to the office. Remember what your workers like for next time as a personal touch. Sit down with them and enjoy a nice meal together. It’s so simple, but helps create relationships and employee engagement. You can also create lunch events on the weekend, where a restaurant is chosen and everyone is welcomed to join. Do you like free stuff? Obviously, and so do your employees! Creating raffles and giveaways is a surefire way to add a fun and rewarding element to the office. You can do it every set amount of time. Every quarter is good, as that equals to 4 times per year. It’s possible to do it even more often, like on every holiday. What should you give away? I suggest items that are universal and everyone can benefit from. Gift cards are the first thing that comes to mind. They can be to a restaurant, store, Amazon, or other services that your workers would enjoy. Every year, organizations lose between $450 and $550 billion from employee disengagement. Don’t raise that number any higher. Make your employees feel special and unique. It’s easily one of the best non monetary rewards there is. When your worker is crushing it, make it known. Like I mentioned earlier, encourage them and give positive feedback. Then, give them something a little extra. How about a better parking spot? Everyone pays for parking at some point or has to trudge through the snow. Make life easier for them by giving them a nice spot close building. Or, how about offering longer breaks and an extended lunch? They’ll definitely appreciate that. While it depends on the exact kind of business that you run, allowing employees to work from home is a very special privilege you can give. Others will see John from the accounting department working from his house and will want to do the same. This will motivate them to work harder so they can too. DO NOT underestimate the power of employee recognition. How much vacation time do your employees get? Would you be happy with it if you were in their shoes? If you said no, then you already know what you need to do. If you said yes, you should offer even more! Sean D’Souza is an award winning author, cartoonist, and marketing strategist. Do you know how much time Sean and his workers take off every year? Yup, you read that right. You can listen to him on the Unofficial Shopify Podcast as he explains it in depth. It’s actually pretty simple. It’s been proven that the more you work on something, the less resources your brain has to allocate to the task. In other words, you slowly become bored and less efficient. How do you resolve that? By taking breaks. This works in both small and large scale projects. For day to day work, you can go for a walk, grab coffee, or take a quick nap. Tuh dah! You feel better, more energized, and can resume being productive. But what about in a yearly sense? More vacation time will make you and your employees refreshed and ready to take on a new quarter by storm. It doesn’t have to be 3 months like Sean does, but you might want to consider upping vacation time in the future. I had a friend that worked in the in the wine industry. He loved it. There was no single person on earth that knew more about wine than him. He was so passionate about it, his energy made you want to become a sommilier yourself. One evening, we were enjoying a glass of Merlot when he told me that he would be leaving the winery he was working at to seek other opportunities. It was simple as that. If there aren’t any opportunities for promotions and advancements, don’t expect employees to stick around for too long. You can have the best business in the world, but your workers have bills to pay and lives to live out. They can’t be stuck in the same position forever, so you need to create room for moving up. Are you able to create new jobs at the moment? Could you in the future? Are there are new departments you could establish? Future career opportunities are a serious incentive for employees you need to consider. Everyone loves money, but it’s not everything. You can still motivate your employees to work harder and be better people in many ways. I suggest working on creating a positive environment, through hiring the right people and making an office feel more lively. Encourage your workers and offer extra incentives like better parking spots or working from home. When the holidays come around and you have to throw a party, make it worthwhile to show up. Have a well known band or comedian there and delicious food. Be personable and buy their lunches some times. Extra points for remembering what everyone likes. Raffles and giveaways are other fun things to do at the office which will make your workers want to stick around. Pair that with added vacation time or chances to move up the corporate ladder, and suddenlya you have a recipe to keep your employees satisfied for life. Hey! I'm Carmine, along with this agency, I run The Copywriting Fox, White Knight Content Marketing, and Mastro Digital. Contact me at any time if you require copywriting services!